Hormel Foods Corporation (NYSE: HRL) today announced college scholarships were awarded to 14 children of current, retired or deceased employees of the company and its subsidiaries. This is the 43rd consecutive year the company’s charitable trust program has offered four-year scholarships to graduating high school students. The 2009 recipients are Billy Cao, Arcadia, Calif.; Jenna Christensen, Albert Lea, Minn.; Kelli Craven, Austin, Minn.; Margaret Craven, Austin, Minn.; Rebecca Gieske, Sauk Centre, Minn; Daniel Hafstad, Rice Lake, Wis.; Stanton Hudja, Atlantic Beach, N.Y.; Danielle Irvin, Rose Creek, Minn.; Ashley Ostrem, Uxbridge, Mass. ; Jessica Pintens, Hillsdale, Wis.; Nicole Schmidt, Paynesville, Minn.; Katherine Schou, Albert Lea, Minn.; Matthew Weiss, Detroit Lakes, Minn.; and Matthew Zellmer, Blooming Prairie, Minn. Scholarship recipients were selected by the National Merit Scholarship Corporation (NMSC), an independent, not-for-profit organization based in Evanston, Ill. NMSC’s goal is to help academically talented students obtain college scholarships. Criteria for the award included each applicant meeting stringent NMSC requirements, which included scores from the Preliminary SAT/National Merit Scholarship Qualifying Test, scholastic abilities, involvement in school and community activities, and leadership qualities. Since 1966, Hormel Foods has provided funds for the scholarship program. The program has awarded more than 250 scholarships to children of company employees. Billy Cao is a student at Arcadia High School, Arcadia, Calif., and is the son of Keping Cao and Fang Qian. Keping is an employee at Farmer John in Vernon, Calif.
Jenna Christensen is a student at Albert Lea High School, Albert Lea, Minn., and plans to major in psychology. She is the daughter of Scott and Cheryl Christensen. Scott is the director of industrial engineering and Six Sigma at the Hormel Foods Corporate Office in Austin, Minn.
Kelli Craven is a student at Austin High School, Austin, Minn., and is the daughter of Douglas and Ardith Craven. Douglas is the corporate manager of sanitation at the Hormel Foods Corporate Office. Margaret Craven is a student at Austin High School, Austin, Minn., and plans to major in biochemistry. She is the daughter of Douglas and Julie Craven. Douglas is the inventory manager of Grocery Products and Julie is the vice president of corporate communications. Douglas and Julie work at the Hormel Foods Corporate Office. Rebecca Gieske is a student at Sauk Centre High School, Sauk Centre, Minn., and plans to major in creative writing. She is the daughter of Daniel and Gilda Gieske. Daniel is a maintenance technician at the Jennie-O Turkey Store Melrose (Minn.) Plant. Daniel Hafstad is a student at Rice Lake High School, Rice Lake, Wis., and plans to major in engineering. He is the son of Kenneth and Lisa Beth Hafstad. Kenneth is an agronomist at the Jennie-O Turkey Store Barron (Wis.) Plant. Stanton Hudja is a student at Lawrence High School in Cedarhurst, N.Y., and plans to major in economics. He is the son of Uziel and Hope Hudja. Hope is a customer executive with Hormel Foods Consumer Products Sales in Lebonon, N.J.
Danielle Irvin is a student at Southland High School, Adams, Minn., and plans to major in biology. She is the daughter of Donald and Renita Irvin. Donald is an employee at the Hormel Foods Austin (Minn.) Plant. Ashley Ostrem is a student at Uxbridge High School, Uxbridge, Mass., and plans to major in finance. She is the daughter of Gary and Jeanine Ostrem. Gary is the regional sales manager with Hormel Foods Foodservice Sales in Boston, Mass. Jessica Pintens is a student at Barron Area High School, Barron, Wis., and plans to major in biology. She is the daughter of Anthony and Aimee Pintens. Anthony is the grow out production supervisor at the Jennie-O Turkey Store Barron Plant. Nicole Schmidt is a student at Paynesville Area Schools, Paynesville, Minn., and is the daughter of Allen and Loriann Schmidt. Allen is a live haul supervisor for Jennie-O Turkey Store, in Melrose, Minn.
Katherine Schou is a student at Albert Lea High School, Albert Lea, Minn., and plans to major in mathematics and statistics. She is the daughter of Jeffrey and Dorrine Schou. Jeffrey is a livestock accounting clerk at the Hormel Foods Austin Plant. Matthew Weiss is a student at Detroit Lakes High School, Detroit Lakes, Minn., and plans to major in architecture. He is the son of Michael and Lori Weiss. Michael is the quality assurance manager at the Jennie-O Turkey Store West Central Turkeys Plant in Pelican Rapids, Minn.
Matthew Zellmer is a student at Blooming Prairie High School, Blooming Prairie, Minn., and plans to major in physical therapy. He is the son of Randall and Kay Zellmer. Randall is a sales and planning manager at the Hormel Foods Corporate Office. Hormel Foods Corporation, based in Austin, Minn., is a multinational manufacturer and marketer of consumer-branded food and meat products, many of which are among the best known and trusted in the food industry. The company leverages its extensive expertise, innovation and high competencies in pork and turkey processing and marketing to bring quality, value-added brands to the global marketplace. 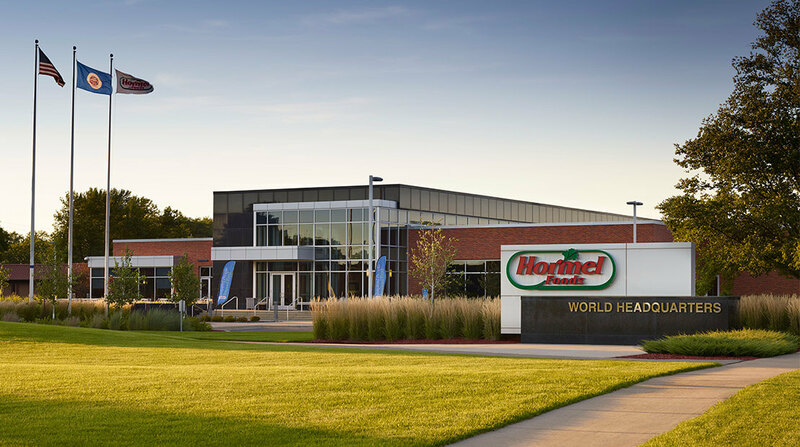 The company is a member of the Standard & Poor’s 500 Index, and in each of the past 10 years, Hormel Foods was named one of “The 400 Best Big Companies in America” by Forbes magazine. The company enjoys a strong reputation among consumers, retail grocers, foodservice and industrial customers for products highly regarded for quality, taste, nutrition, convenience and value. For more information, visit https://www.hormelfoods.com.